Although I wasn’t a fan of Play Books when it first came out, it’s now winning me over. Google has now given Play Books the same functionality as its other apps, giving it the same simple and intuitive UI that makes it feel like a Google product. 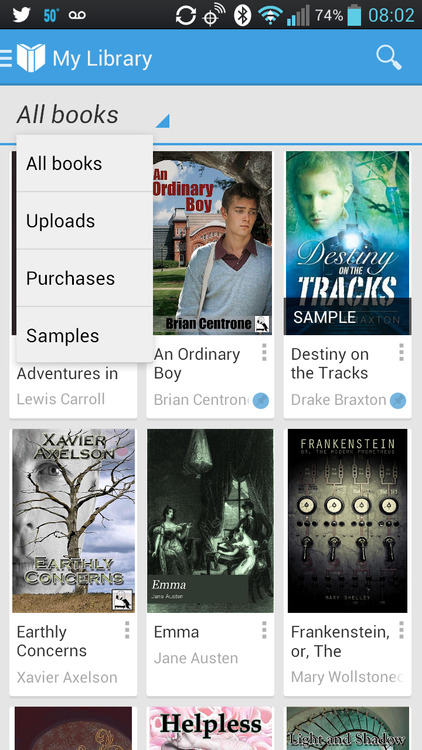 It also brings your eBooks to the cloud and allows you to upload eBook not bought from the Play Store to your library. For me, this was a key feature. I love how Play Music does this for my music collection and it was the one thing I really wanted for Play Books back when I originally reviewed it. Like all Google products these days, the interface is clean and simple. It opens on the Recent tab, which displays your most recent activity, bringing the book you’re reading to the front followed by any new purchases or uploads. Below that are recommendations for you that Google choses by what you have in your library. A simple swipe from the left shows the navigation pane, which allows you to go to your library or shop for more books. When you go to your library, there’s a pull down menu that allows you to filter your title based on specific criteria (the default display is by title). This is great except for the simple fact that authors is not one of the filter options. How Google missed that is beyond me, but I hope they add it soon. Using the app is simple and has all the function you want in a reading app. Hold your finger on a word and you can get the definition in a card at the bottom of the screen. If you want to see the entire card, swipe up and it appears. A long press also allows you to take a note, highlight text and add a bookmark. If you want to see how far you are in your book, a simple tap will do the trick. This will also allow you to go to the table of contents, your bookmarks and your notes. It also displays a search option at the top of the screen. 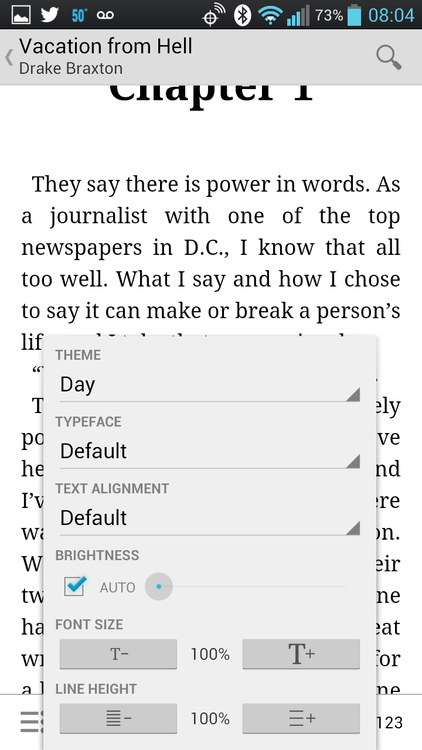 The display options allows you to tweek how your eBooks render, from fonts to background. Settings allows you to download eBooks over WiFi only and turn the page animation on and off, along with the standard options you would expect. You can upload eBooks not purchased via Google on the Play website. Just go to Play>Books>My Books and you’ll find the Upload option at the top. I’m hoping they Google adds this functionality inside the app itself, which will allow people who download books onto their tablets or phones to simply upload them without having to go to a computer.